What is life like for gay men and women in Russia? Sergey Khazov looks at the country's gay infrastructure, and discovers a very fragmented picture. Until a couple of years ago homosexuality was, if not a forbidden topic (it was decriminalised in 1993), certainly a rarely discussed one. Since then twelve regions, including St Petersburg, have passed laws banning ‘gay propaganda’ aimed at children and young people. The national Parliament has followed with similar legislation, albeit with the word ‘homosexuality’ replaced by the less explicit ‘non-traditional sexual relations’. The wide public discussion around this legislation has led on the one hand to an upsurge in protest activity by the LGBT community, and on the other to an increase in aggression against its activists and gay people in general. But what does it mean to be gay in Russia? Where is there support available and who is protecting the rights of the country’s estimated five million gay men and women? This overview will take us to the ‘two capitals‘ — Moscow and St Petersburg — but we begin deep in the Russian regions, in the Volga city of Samara. Thirty seven year old Mikhail Tumasov is commercial director of a press distribution company in Samara, a large industrial city on the banks of the Volga and a neighbour of Tolyatti, home of the giant AvtoBaz automobile works. Up to a few years ago Mikhail lived the life of a typical gay Russian: hanging out with friends at their homes, making contacts online, occasional nights out at the ‘Iguana’, the only gay bar in Samara (occasional because he finds it ‘boring’). He didn’t particularly hide his sexuality, but didn’t flaunt it either. He didn’t talk about his private life at work - his close friends knew, nobody else asked. Mikhail was lucky with his senior management, and having a senior job himself he was able to avoid colleagues’ curiosity. Gay Russians generally have to hide their orientation and either just keep quiet about their private lives or invent non-existent wives or husbands. But while acceptance levels are still low, the internet has made it much easier to find friends and information. Even if you don’t have your own computer, there’s always an internet café. And in big cities people try to have smartphones so that they can use Grindr or Hornet, apps which allow gay men to track the locations of potential sexual partners. Another popular site in provincial Russia is VKontakte, the Facebook equivalent famous not only for its shameless infringement of copyright (you can download just about any music or film for free) but for its numerous specific interest groups. Like many gays (and not just gays) Mikhail was single for a long time before meeting a young man whom he later split up with, and then eight years ago he met Denis, whom he now simply calls his husband. ‘It was all very banal’, he says. ‘We met at a New Year’s party at some friends’ place, and it was love at first sight. We immediately started living together and have been together ever since, except now Denis has a job in Moscow, so I’m thinking about moving there too.’ Four years ago they bought a flat together and share the mortgage payments, although only Mikhail’s name is on the deeds, and they can’t register as joint owners until the mortgage is paid off. A year and a half ago Mikhail’s quiet life came to an end: he got caught up in activism. At first it was just collecting signatures protesting against the anti ‘gay propaganda’ legislation that had just been passed in St Petersburg, and setting up a VKontakte group called ‘Averse’ to forward this cause. But then: ‘I met this nice couple, Anton and his wife, on a train, we got talking and they invited me round to their flat in Samara. For quite a while now I’ve followed a rule that if I get close to someone, I tell them about myself. And I told them everything. When I was leaving Anton went to show me out, and then beat me up in the lift - because ‘I hadn’t told them straight away; got his trust, didn’t come up to his expectations; there was him thinking I was a normal bloke’. He was at Police College, so it was probably difficult for him’. After this friendly supper Mikhail spent three weeks in hospital with concussion, but first he went to report the incident to the police. ‘It was really scary. In the first place, I had to tell some complete stranger about how I was beaten up for being gay, and in the second, there I was basically unintentionally coming out – and I’m pretty well known in Samara. The cop freaked out, of course, but he kind of saw my point, said that you shouldn’t get beaten up for such a thing, although he ended up by saying something about how we need a morals police to stop people being homosexual’. St Petersburg is best avoided in the winter. The cold wind off the Gulf of Finland penetrates your very bones, so you freeze in an instant, no matter how warmly you dress; the sun disappears for months on end and you seem to have landed in an everlasting polar night. The people are equally cold, and even museums are always in semi-darkness, as though they are just about to close. In summer, on the other hand, you can’t fail to fall in love with ‘Piter’, as it is affectionately known to Russians: elegant 18th and 19th century palaces built by European architects; churches more reminiscent of Catholic basilicas than Orthodox temples; wide avenues, canals, little squares in the most unexpected places... You can spend hours wandering along the embankments, you can see the city from a river tram and even sunbathe on a tiny beach next to the Peter and Fortress, where all Russia’s emperors were buried. And on a Friday or Saturday evening you can, if you like, stroll through the gay district. No, it’s not a joke: it’s simply that two of the three local clubs, ‘The Blue Oyster’ and ‘Central Station’, are very close together and near Nevsky Prospect, the city’s main drag, and the Gostinny Dvor shopping centre, so that on a Friday evening you can imagine you’re in Amsterdam or the Marais in Paris. Just like in other European capitals, the crowd doesn’t hang around in one place and by 2am it’s moved to the third club, ‘Cabaret’, dancing the night away to a drag show that surprisingly enough is better than any in Moscow (perhaps because the backing dancers are professionals). The lesbian scene is quite developed here. In addition to social network-organised informal ‘meetings’, the northern capital has two dedicated women-only clubs — ‘3L’ and ‘Infiniti’ — one mixed club called ‘Malevich’ and two parties, ‘Yuppie Ladies’ and ‘Caramel Girls’, that travel from one venue to another. It is not only for the nightlife that St Petersburg has acquired the title of the gay capital of Russia. It’s also the centre of the country’s LGBT movement — this despite the fact that the notorious ‘anti-gay propaganda’ law originated here, the brainchild of Vitaly Milonov, a member of the local legislative assembly. 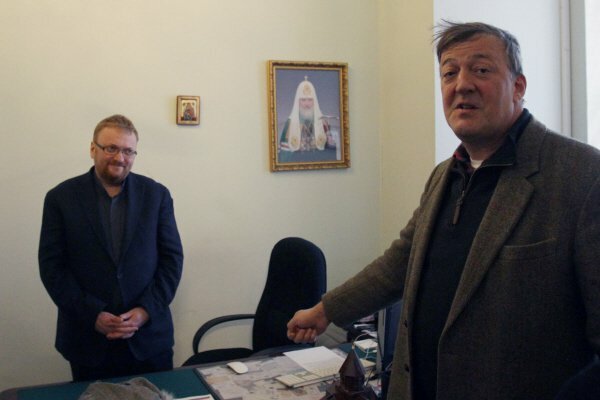 Actor, writer and broadcaster Stephen Fry, who is himself gay, interviewed Milonov in St Petersburg in March 2013, and afterwards tweeted to his five million followers, ‘He looks at life from an Orthodox Christian point of view, as though liberal gay circles are engaging in propaganda and want to invade nurseries and steal children’s souls’. 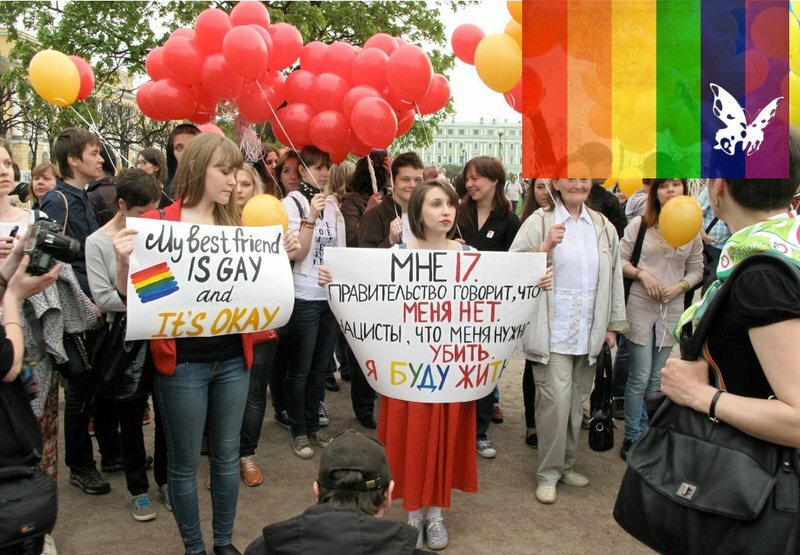 St Petersburg is home to the headquarters of the Russian LGBT Network, founded in 2006 and still the only organisation protecting the rights of the LGBT community at national level. ‘We have offices in sixteen regions,’ its chair Igor Kochetov tells me. ‘We try to work actively in areas where there are no local organisations, and advise them on a wide range of issues as soon as they are set up.’ The Network also runs information campaigns and seminars as well as awareness-raising activities. ‘We are the only organisation in Russia that collects and analyses information about discrimination on grounds of sexual orientation and gender identity’, he says with pride. The LGBT network set up the first specialised helpline, staffed by trained volunteers. ‘We have 30 ‘helpliners’, some of them professional psychologists and lawyers,’ explains Kochetov, ‘and we take about 1000 calls a year. If someone rings and the person who takes the call can’t solve their problem, their number is taken and a specialist calls them back. And if we know there’s a counselling service in their own area, we’ll refer them there.’ The helpline has a freephone number, which is important in a country where intercity calls are not cheap. Most of the calls touch on similar issues: people finding it difficult to accept their own sexuality; lesbians whose ex-husbands want to remove their children from them; transsexuals who need new ID documents; complaints about threats, attacks, blackmail and the behaviour of the police. The Network isn’t particularly active in St Petersburg itself, which is understandable given the number of other LGBT activists there. Take for example the ‘Vykhod’ [Coming Out] organisation, founded in 2008, which covers much the same ground, from the organisation of pickets against homophobic laws through psychological and legal advice and support to a ‘Parents’ Club’ whose members support not only one another but young people as well. ‘Vykhod’s’ main activity, though, is putting on its annual ‘Queerfest’, which includes exhibitions, film showings, concerts and discussions. Last year saw the appearance of the ‘Alliance of Straights for LGBT Equality’, which also runs pickets, collects signatures on petitions calling for Milonov’s resignation, and generally supports members of the LGBT community. ‘People here aren’t as homophobic as you might think,’ its coordinator Natalya Tsymbalov tells me. ‘When we did one-person pickets on 7th April, people on the street reacted quite positively, and on 1st May, when there was a big democratic demonstration in St Petersburg, we took part in it in our rainbow column, and the only negative reaction came from young nationalists who shouted that we should all be sent off to Auschwitz. The first ‘Side by Side’ LGBT themed film festival in St Petersburg also took place in 2008, and quickly became a major event nationally as well as locally. The festival runs not only in St Petersburg itself, but goes on tour to Moscow, Tomsk and Perm. ‘We’d also like to run it elsewhere’, says festival director Gulya Sultanova, ‘but it hasn’t worked out so far. In 2012, we did hold two festivals in Novosibirsk, but we were literally attacked by local nationalists and church people. We phoned the police and they did turn up, but didn’t do anything. In the end we had to organise taxis for audience members and we ourselves had to more or less run away from the demonstrators, who were on motorbikes. One of the police officers told me that they wouldn’t come out for us at all the next day, because no one wanted to protect us. So we cancelled the final day of the festival.’ In the other cities the ‘Side by Side’ festival ran into problems with venues: as soon as the organisers found a screen and announced their programme, the cinema manager would get a phone call from city hall. Life in Moscow is different from life in the rest of Russia, helped by the fact that 80% of the country’s financial flow and 50% of bank capital is concentrated here. The nightclubs here, ‘Three Monkeys’ and ‘Central Station’, as well as several bars, are much bigger and can afford DJs and even singers from abroad. Admittedly, on the Moscow gay scene it’s not done to hang out at gay bars – the city is full of ostensibly straight watering places that in fact attract a very wide clientele, from the ‘Denis Simachov’, opened by the fashion designer of the same name, where Moscow’s bohemians gather , to ‘Solyanka’, with its ‘Love Boat’ nights where yesterday’s (or even today’s) schoolkids dance with hipsters from glossy mags and PR agencies. Moscow’s nightlife is in constant flow in all senses – new bars open, old ones close or change their concept, so there’s always something to talk about as you lounge on the latest trendy terrace. It’s easier to be gay in Moscow than in the provinces, though even here a lot depends on your work and your family – not all gays work in advertising or the media. On the other hand, people on the street pay no attention to tight jeans or a screaming scarf (in the regions it’s a good idea to be a bit less camp), cabbies know the addresses of not just gay bars but gay saunas, and women aren’t treated like old maids if at the age of 25 they don’t have a husband and kids. For whatever reason, the LGBT movement in Moscow is much less active than the St Petersburg one, and generally only follows its lead. There is a branch of the LGBT Sports Federation (born in 2010 at the Cologne Gay Games), a ‘Rainbow Association’ and other support and mutual aid groups. There are the usual pickets and public actions, which usually end in a police station, and a Parents’ Club and Alliance of Straights for LGBT Equality. Activists are not immune to the same pressures as elsewhere in the country: harassment, violence and official indifference. The new law, too, is having an effect. ‘We have to restrict all our activities to over-18s’, says Igor Yasin, an activist from the Rainbow Association. ‘But we do try to help younger people where we can. Just recently a young activist started having problems at school when people found out about his sexuality. And it wasn’t just his classmates that were giving him a hard time, but teachers as well. It started affecting his schoolwork, so we had to intervene. We asked for help from the ‘Street Children’ organisation, which doesn’t really deal with LGBT issues, and surprisingly there were people there who could help him. But that’s a one-off case, especially since the lad was very active and could stand up for himself. Of course Moscow is like all capital cities – it likes people who can stand up for themselves. As for the rest – well, they still have to phone the volunteers in St Petersburg. oDRussia will be publishing an extract from Sergey Khazov's unpublished book, ‘A different childhood’, later in the week.